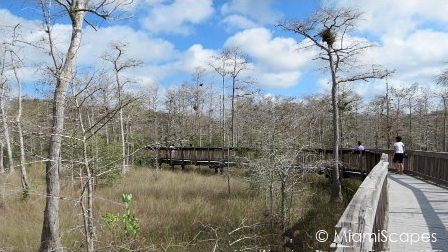 This is one of our favorite strolls at Big Cypress, the Kirby Storter Boardwalk will bring you up close into the swamp without having to get your feet wet! 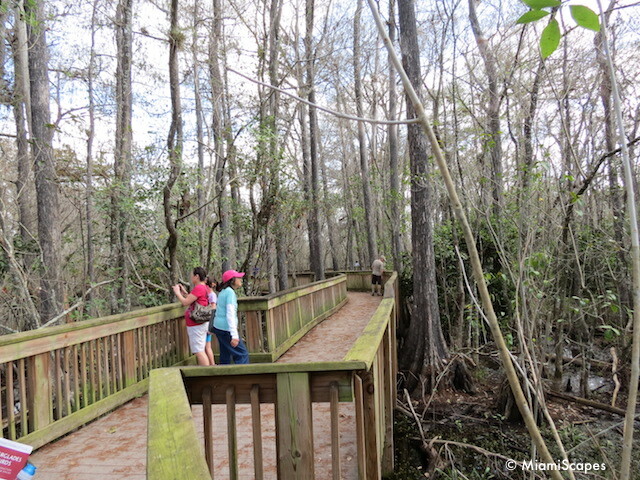 This half-mile boardwalk (one-way) takes you right through the heart of a Bald Cypress strand, huh? What's a cypress strand? A strand is an area where the elevation drops, sometimes just a few inches, and more nutrients collect in here that support larger trees. 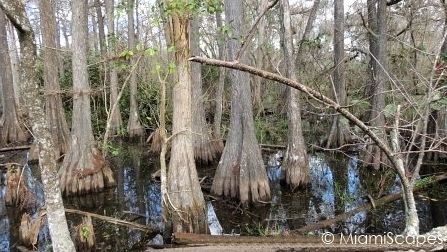 Cypress trees grow in the strands since they are able to withstand the flooded conditions and have adapted well to the annual flooding patterns in South Florida. 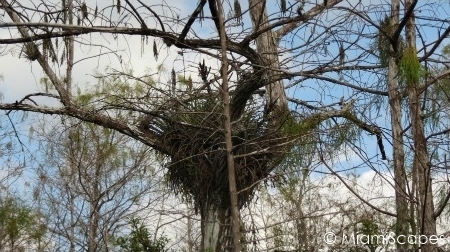 About a third of Big Cypress National Preserve is covered with Cypresses. Although most cypress trees are of the dwarf pond variety, the ones at Kirby Storter are the giant bald cypresses which are almost gone due to deforestation in the 1930's and 1940's. These great cypresses are 600 to 700 years old, truly a majestic sight. 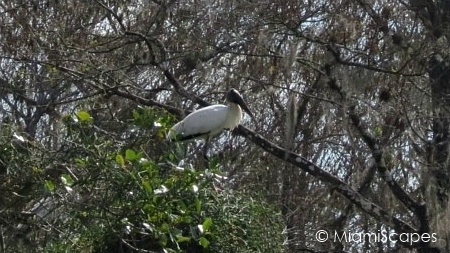 Not only they provide a habitat for a number of plants and animal species, some of them endangered like the wood stork, but they are essential in managing the water that flows through the Everglades. Kirby Storter is only a couple of miles west of Big Cypress' Oasis Visitor Center, you will see the signs and ample parking lot. 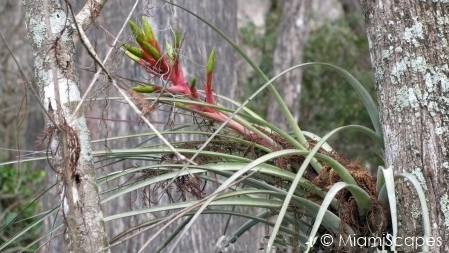 As you wind down the stretch, check out the air plants that look like giant bird nests on the tall trees, these are not parasites, just merely use the trees for support but take all their sustenance from the air. Then you leave the prairies and enter a shaded area, vegetation thickens and the cypress strand envelops you. 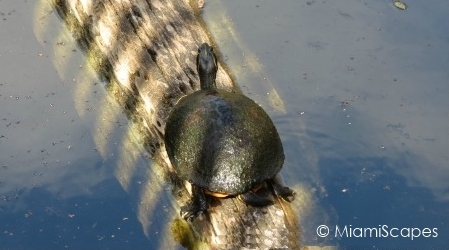 You are in the middle of the cypress swamp. 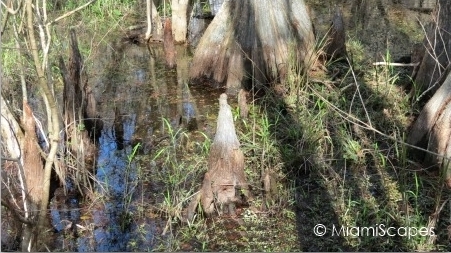 Check out the cypress knees, which look like stalagmites sticking up from the swamp and serve to support the shallow roots of the cypress trees. There is a viewing platform at the end of the boardwalk which overlooks a small pond teeming with wildlife, take your time here, there's lots of action surrounding you. And of course the alligators might be scurrying underneath the planks as well. 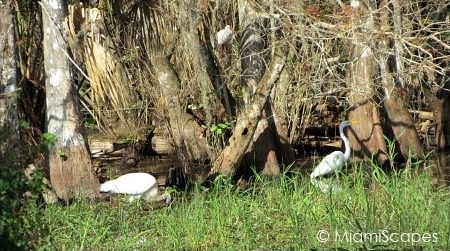 Here's a short clip from Kirby Storter for a quick look into the heart of the Cypress swamp! How long does it take to "do" the Kirby Storter Trail? From the start of the boardwalk by the parking lot to the viewing platform at the pond it is about half a mile, here we like spending some time and check out what's happening and who's around. So normally we would allow at least an hour for this trail. Where: Tamiami Trail at mile marker 63, just a couple of miles west from the Oasis Visitor Center. See the Tamiami Trail Map here. When: Boardwalk is open 24/7. Other: Picnic tables, check at the visitor center for ranger-led walks to Kirby Storter.